Uplift Organizer Maia Wikler reflects on politics, Native sovereignty, and ecology. She interned in Washington, D.C. during the spring. In March, the Chairman of the Standing Rock Sioux Nation traveled to Washington, D.C, in a fight for time. The Army Corps of Engineers had conveniently sidestepped a mandate by the National Historic Preservation Act that calls for tribal consultation in regions of sacred significance prior to any construction that could impact the area. The Army Corps failed to even notify the Tribe of the Dakota Access permit proposal until the final stages when a construction date had already been set and promises for permits made. Even more shocking, the Standing Rock Sioux Reservation was missing from the maps used by the Army Corps in the Dakota Access proposal process. The reality the Army Corps and Dakota Access were avoiding is that the pipeline would desecrate 11 sacred burial sites and pose a grave danger to the main source of drinking water for the Standing Rock Sioux Nation in South Dakota. Both the EPA, the Advisory Council on Historic Preservation and Department of Interior have strongly urged the Army Corps of Engineers to reconsider the permits given to Dakota Access that completely lacked Tribal consultation. It is in situations like this, of a political process to secure economic prospects while compromising human, cultural and environmental rights that voices and stories need to be heard. The U.S. government has taken nearly everything from Native nations, through rampant displacement, treaty negligence, resource extraction, forced cultural assimilation in Residential Boarding schools. I see a relentless greed to conquer land, energy, and culture. Yet long-standing resistance to colonialism persists, and a movement is building to assert Native rights and sovereignty. The Dakota Access pipeline isn’t a simple energy development. As pipeline spills have shown time and again, it should be criminal to consider the project without extreme attention to detail. The fact of the matter is, pipelines leak and we don’t have adequate technology to detect the inevitable spills. In 2012, the Keystone Pipeline leak detection system missed countless oil leaks. 20% of spills were detected by local citizens and 60% detected by pipeline employees. Leak detection systems are designed to find major ruptures, but 76 percent of leaks between 2002 and 2012 involved fewer than 30 barrels of oil. During that period of time, there have been 960 oil spills. The small leaks add up. Just three months ago, TransCanada had to shut down its Keystone pipeline due to an oil spill in South Dakota, detected by a local landowner. Anthony Swift, from Natural Resources Defense Council, stated, “[The] Keystone oil spill is the latest stark reminder that all too often with pipelines it's not whether they will leak but when.” History shows that the technology that is referenced to support construction proposals and used to reassure public and environmental concern simply isn’t good enough. Every minute counts for spill detection and action. These pipelines carry a toxic mixture of heavy tar sands bitumen and light liquid chemicals and pass through sensitive territory. Ninety miles of a Nebraska pipeline pass through the Ogallala/High plains aquifer. And, in the case of the Standing Rock Sioux Nation, the Dakota Access Pipeline would cross the Missouri River, their main water source. In the inevitable future of inherently faulty pipelines, there is no time for delayed action. On an uncharacteristically sweltering day in April, the Chairman of the Apache Nation arrived in Washington, D.C. to fight against the sale of sacred Apache land, Oak Flats. This time, the development company was Resolution Copper and pushing it through was Senator John McCain. The case for Oak Flats is the latest Native land grab by the U.S. government. Oak Flats has had special protections since 1955 when President Eisenhower banned mining from the area because of its “cultural and natural value”. In 1971, President Nixon renewed this ban. Senator John McCain single-handedly turned back the clock in December 2014 when he slipped a fine-print rider into a thousand-page National Defense Authorization Act. What was in the fine print? The sale to privatize sacred Apache land to an Australian mining company called Resolution Copper. The impacts of the proposed copper mine are unprecedented because Resolution Copper will be using block cave mining methods. The impacts are permanent and devastating. The result of block cave mining, seen in Wyoming. 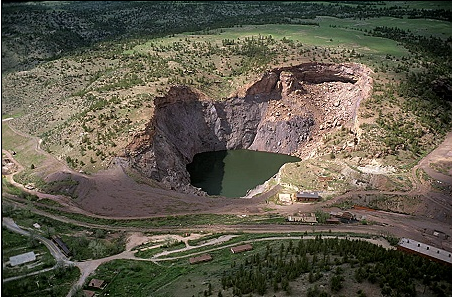 It pales in comparison to the 7000-foot deep pit that Oak Flats might become. Washington, D.C. reminds me of the Twilight Zone; the sheer impact politicians can have is surreal. And perhaps that is where part of the problem lies. It’s a small city, concrete, with endless noise pollution, stop and go traffic, gentrification, ongoing construction—the list goes on. It is an epicenter of not only politics that impact this country but also the world. During my time in D.C., I found the elite power bubble that key stakeholders, decision makers, and influencers live, thrive, and work in the most disturbing part of all. The very circuitry of this country has been disconnected from the principles of co-existence between the environment and humans, instead rewiring itself to man-made manipulations and concrete. Our politicians lack a grave humility. In D.C., this disconnect leads to environmental and cultural devastation as resource extraction projects are approved without foresight. And yet, how can politicians and key influencers make appropriate decisions when they are plunged into a new and dangerous human-centric ecosystem? The consequences of this disconnect are clear; politicians are already making damaging decisions that will impact our future and this earth for generations.